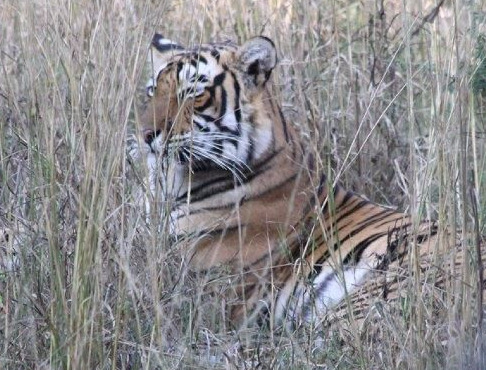 Beyond the Golden Triangle - Temples , Tigers , Turbans and Tea. This trip had been booked well in advance of the above dates , with the ‘ Golden Triangle’ referring to the route from Delhi to Agra to Jaipur . The beyond bit was the visit to Ranthambore National Park .Via on overnight flight to Delhi the first thing that hits you is the amount of traffic on the roads when heading down town from the airport , manic is an understatement . The other is the smog , yes from the cars but also from the late season burning of the rice stubbles in the wider countryside .The first site visited was Qtub Minar complex in Dehli where Qutbuddin Aibak laid the foundation of the Delhi sultanate., the tower with a 5% lean is 74 metres high . There is also a 4th century Iron pillar which shows no sign of any rusting a tribute to Indian metallurgy . The site was not without any wildlife with Black Kites constantly over head and striped squirrels chasing over the ground and trees .An early start the following morning saw us venture out into ‘ New Delhi ‘ so named after the British built this area between 1911 and 1931 to be the showcase of the Empire , with independence in 1947 it became the centre for government of this vast country . One of the departments here is the coast guard commission quite amazing when the nearest coast is 2000Kilometres away . It really is very impressive but is deserted on weekends apart from the rather funny gangs of Rhesus macaque monkeys everywhere ‘ Only in India ‘ could this happen. Into Old Delhi saw a visit to the Jami Masjid mosque the largest in India where at special prayers on select Fridays up to 20,000 people can be seen worshipping , on these days it is obviously closed to outsiders. A cycle rickshaw ride through Chandni Chowk one of Delhi’s oldest trading streets brought you into contact with real commerce amongst the excitement of the forthcoming Diwali festival . Passing the Red Fort we came to Rajghat the site of Mahatma Ghandi’s cremation, what a moving experience it was . A granite slate and an ever burning flame mark the site of the’ father’ of this nation . The next site was Humayun’s Tomb where the second mughal emperor was laid to rest by his widow , the style of architecture gave rise to further structures such as the Taj Mahal . Dating from 1565 it really is a masterpiece in its own right you can see the Persian influences in every detail .A rather leisurely drive to Agra took us down the Yamuna expressway out of Delhi through many many unfinished high storey living complexes on the south side of the city . Many people would think that Agra is a small place with a TAJ it is far from it , it is a conurbation of over 2 million inhabitants . The traffic once again was manic a vast fusion of tuk tuks ,cycles , cars , oxcarts, buses the lot! The next morning was to be the highlight of the tour The ‘Taj ‘ A slightly later start saw admission to the site at about 9-30 am but wow the sheer beauty of the place and the way in which the light catches its every facet leaves you speechless. Photography never can do this place justice, all built in the name of love by Emperor Shah Jahan as a memorial to his favourite wife Mumtaz Mahal who died giving birth to their 14th child ,being built all in the image of an Islamic garden of Paradise . Taking 22years to complete , costing 41 million rupees and the work of 20,000 workers it is staggering . Nowadays many local craftsmen in marble inlay work are the direct descendants of these early craftsmen . 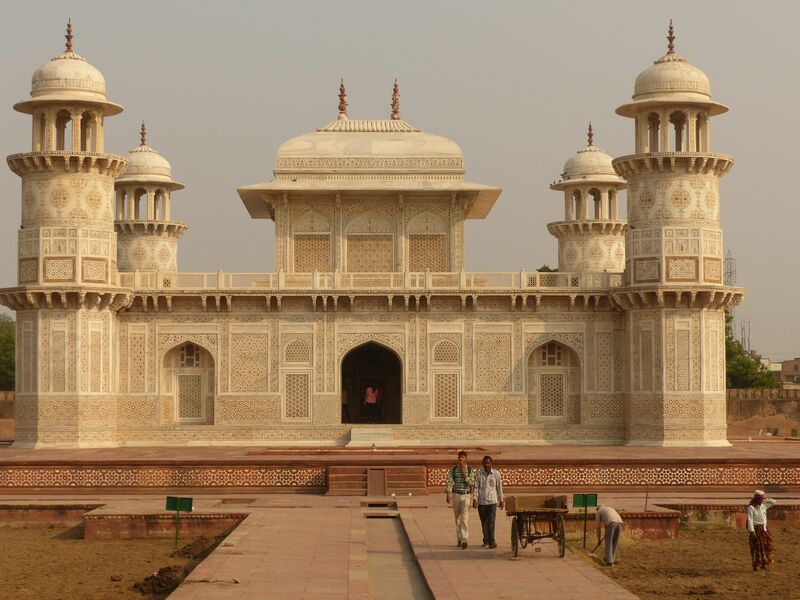 Just a short distance along the Yamuna river is the ‘baby Taj built by Itimad- ud-Daulah this marked the transition from red sandstone to intricate designs in marble absolutely stunning once again . 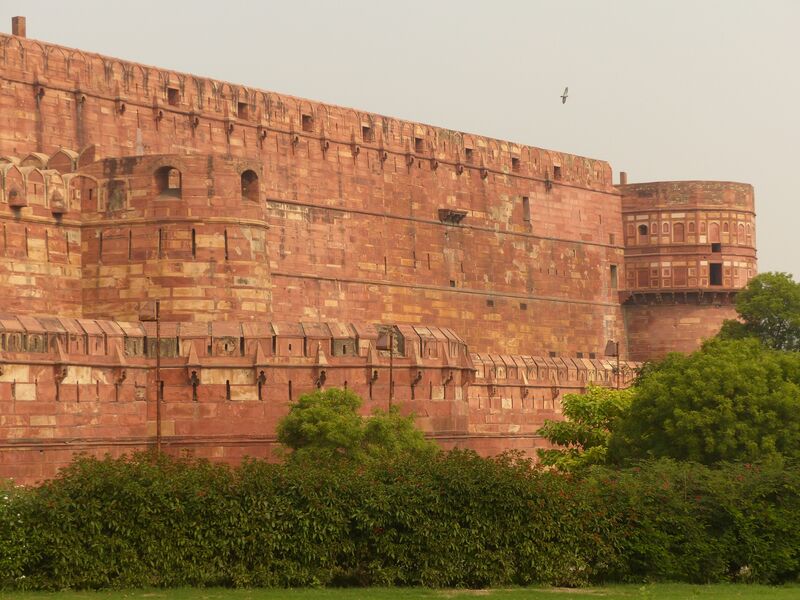 The Red sandstone architecture was very much in evidence at the Agra fort complex with its stunning views down the Yamuna river .Heading off west the following morning to Fatehpur Sikri this was built by Akbar the powerful mughal emperor to commemorate the birth of his first son. He named the city after the mystic sufi preist who prophisised this event ,it was abandoned after 11 years due to water shortages amongst other reasons .Leaving here we all had a train to catch at Bharatphur, yes British Rail it arrived on time but proceeded in a very slow fashion down to Ranthambore checking in some 55 minutes late . Being whisked off to the appropriately named Tiger Den hotel this evening was spent dreaming of a close but safe encounter with old Stripey the next day.An early start made it possible to get to our vehicle and guide to get us signed in to explore zone 3 of the park , you are only allowed a maximum of three hours before you have to exit . It is a case of looking and listening for the sounds of the wild inhabitants such as langur monkeys and the spotted deer as they are the first line of alarm calls when the tigers are active , probably something to do with them not wanting to be the next meal . Two trips one in the morning and again in the evening didn’t reveal any sightings of old stripey but plenty of other things were seen including many species of birds and a lot of the parks mammals .Back on the road the following day saw us hit the road again this time heading for Jaipur the State capital of the adjoining state of Rajasthan. This has the name of the ‘Pink City , after its founder Jai Singh ordered the walls to be painted Terracotta pink . It is famous for its gemstones and jewellery along with its textiles . It had also featured as a set for the two New Marigold Hotel films with its stellar cast . This place with all its vibrancy and the Diwali celebrations of that evening really was an incredible place to experience .Jai Singh really was a genius ahead of his time he planned and constructed a true urban city , he invited craftsmen, scholars, tradesmen and a whole host of other visionaries to join him in his innovative plans which were started in 1727. He even built the Jantar Mantar an observatory for the stars , weather predictions and to tell the time with an accuracy of within 20 seconds ,so there was no wonder he had the title of the One and a quarter which referred to his superior intelligence . High up on the hill overlooking Jaipur is the Amber Fort established in 1592 by Man Singh it featured 17 Kms of walls, a lake and defence water system as well as fortified walls this was the old city until Jaipur was born . It really was so different with incredible views all around .You could take an elephant ride up to the walls and then take in the various tiers of this palace and fort complex .Moving on to Samode Bagh this gives an opportunity to ‘glamp ‘ although they look like tents from the outside they are in fact real upmarket chalets with all of their exquisite wall hangings, the food, service and grounds were just superb. It just gave a chance to visit Samode Palace which is now an Indian heritage hotel with prices starting at £400 per person per night it really was on another planet but you were permitted to look around and see just how the other half live .India is a truly remarkable place , one which arouses all of your senses , it is a photographers dream destination with image opportunities around every corner . This will definitely not be my last visit, seeing Mr Stripey is still on my list and will remain one of my lifes quests. This report really is a very condensed view of what was a once in a lifetime trip which exceeded any expectations I may have held previously, do go for yourself and allow India to take hold of your soul . ..